A peaceful canal-side new development within walking distance of Paddington Station and Marble Arch, Paddington Central is an 11 acre site, home to big businesses - including Microsoft, Accor, Kingfisher, Rio Tinto and Statoil - cafes, restaurants and a floating classroom. 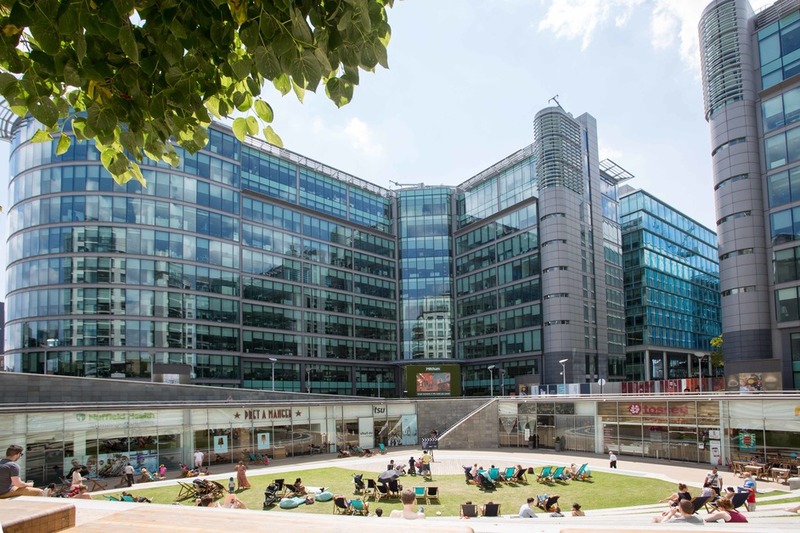 The office buildings are set amongst two landscaped squares - including Sheldon Square - and the site has a lovely waterside location on the Grand Union Canal, offering an attractive working environment, a gym, cafes and restaurants and plenty of space to sit out for an al fresco lunch stop. TRAVEL: When Crossrail comes in 2018 Paddington will be one of only three Crossrail stations in west London, which will improve connections from the West End to the City and Canary Wharf. What are the best dining options near Paddington Central London? Paddington Central gyms, sporting activities, health & beauty and fitness. The best pubs near London Paddington Central. Paddington Central clubs, bars, cabaret nights, casinos and interesting nightlife. Where to have your meeting, conference, exhibition, private dining or training course near Paddington Central. From cheap budget accommodation to luxury 5 star hotels see our deals for Paddington Central hotels, including Hilton London Paddington Hotel from 82% off.